These commentaries were conceived as celebrating the pleasures of country living, with occasional digressions. This is one of those occasions and one of those digressions. A cultural moment back in the city – I’m referring to New York City – so charmed that you’re almost required to pay a visit. I’m not speaking about seeing “Hamilton” on Broadway. Visiting your kids in Brooklyn. Or making your way to Trump Tower, whether to protest or register your support. No. I’m talking about taking a ride on the brand new Second Avenue subway, as I did last week. This thing has been in the works, on and off, for almost a hundred years. So the city, state, and Governor Andrew Cuomo, who dragged the project over the finish line, deserve credit for perseverance. It’s still sparkling clean, which is more than I can say about almost any other line in the city. The peculiar odors and rodent life one associates with subway travel are thus far absent. But there’s one reason above all others to board the subway at one of its three new Second Avenue stops – 96th street, 86th Street or 72nd Street. I’ll get to it momentarily. But first I need to go on the record as a big fan of the subway system, even before the new stations came along. It’s too easy, and actually occasionally fun, to criticize it. Among experiences lacking aesthetic appeal, a ride on the Big Apple’s transit system must rank near the top. The stations tend to be dark and dank, if no longer routinely dangerous. The noise can be deafening, and that’s even before buskers enter your subway car with their guitars and drums under the presumption that you desire to be entertained. Admittedly, the “countdown clocks” that display the number of minutes until the next train arrives, even if they sometimes lie, have reduced the fear that the train will never come and you’ll be stuck underground forever. However, the system remains so illogical that even lifelong New Yorkers can look up from their books or Kindles and find themselves pulling into 125th Street when they were only going as far as Columbus Circle. And then there’s the moment we’ve all shared where the local train waits to close it doors until the instant the express arrives, as if baiting us. But balancing all that is the fact that when it’s running smoothly, there’s no way to get around town faster, cheaper or with a smaller carbon footprint than on the subway. You can board the train uptown, half an hour before a meeting in Soho, Tribeca, or Wall Street and arrive ten minutes early. Those of us who are forced to take the subway at rush hour may disagree, but the city’s greatness is spelled by the social contract observed by riders of every conceivable stripe packed into its seats and clutching its poles. Central Park and the Metropolitan Museum are overrated. If you really want to experience the city’s majesty, it’s the unconscious cross-pollination that occurs among you and fellow passengers sitting around you. So what about the new Second Avenue subway? Unlike the typical station where the ceilings are so low you can almost bump your head on the mechanicals, or get dripped on by strange fluids, the new stations are spacious, brightly lighted and filled with art. 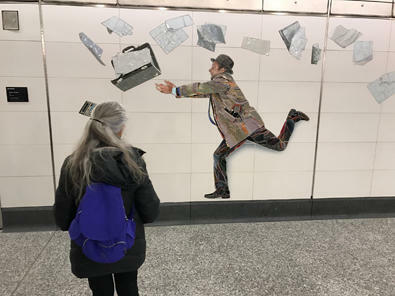 My favorite is the 72nd Street station where three dozen characters – representing the kind of people one encounters on the subway (the friendly kind, not the ones who try to shake you down) – are rendered by artist Vik Muniz in shimmering mosaics. My wife also visited last week and asked a transit worker why there were so many of them milling around. She though it was perhaps to ensure the trains ran smoothly. But she was told MTA workers were visiting in droves because they’re as excitied as the public to see the new stations. But here’s the reason above all others to celebrate the new stops. They change your experience of the city. And I say that as someone who has lived there my whole life. What surprised me most wasn’t descending the burnished escalators and enjoying the art of Sarah Sze, Chuck Close and Jean Shin along the way, in addition to Mr. Muniz. It was ascending those same escalators to street level. Avenues and buildings I’ve seen forever suddenly looked different, refreshed. They seemed alive with possibility. Their neighborhoods had become destinations in their own right. It felt akin to when electricity, or perhaps these days Wi-Fi, finds its way to a remote country road. Because, when you think of it, as routine as subway travel becomes, the simple act of emerging from underground into the light of day is an invitation to the senses. It’s one the Second Avenue subway, at least in its opening days and weeks, refuses to let you take for granted. Ralph Gardner Jr. is a journalist who divides his time between New York City and Columbia County. More of his work can be found at ralphgardner.com. Come the New Year we can’t help but look ahead to the next twelve months and wonder about the ways our lives will be different or the same a year from now. Personally, professionally, politically. Among the perks of being an empty nester is that you’re not enslaved by your children’s school calendar. When our daughters were younger we left the city as soon as school was dismissed Friday afternoon and returned Sunday night. I’ve got a confession to make. I like fruitcake. I don’t understand why fruitcake is a punch line. You know, like the joke that there’s only one fruitcake in the world and it’s constantly being regifted.